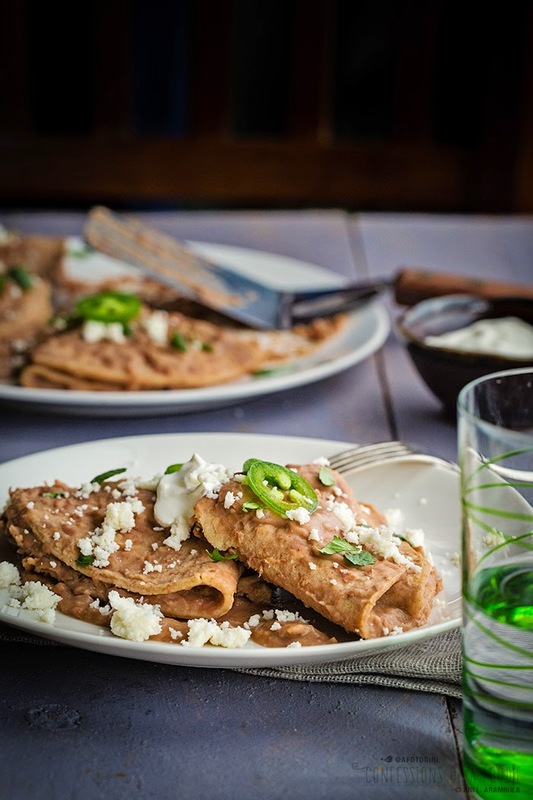 Total Mexican comfort food, enfrijoladas are simply corn tortillas drenched in soupy mashed refried beans. Perfect for Meatless Monday. "What did you make yesterday?" asked my mother during a visit early Sunday afternoon knowing that I devote my Saturdays to cooking and shooting for this space. "Remember the tortillas in beans that you used to make for us?" "Yes, of course," she answered. "That's what you made?" I laughed. "Yes," I answered. "Did you know that it's a real Mexican dish with an actual name? 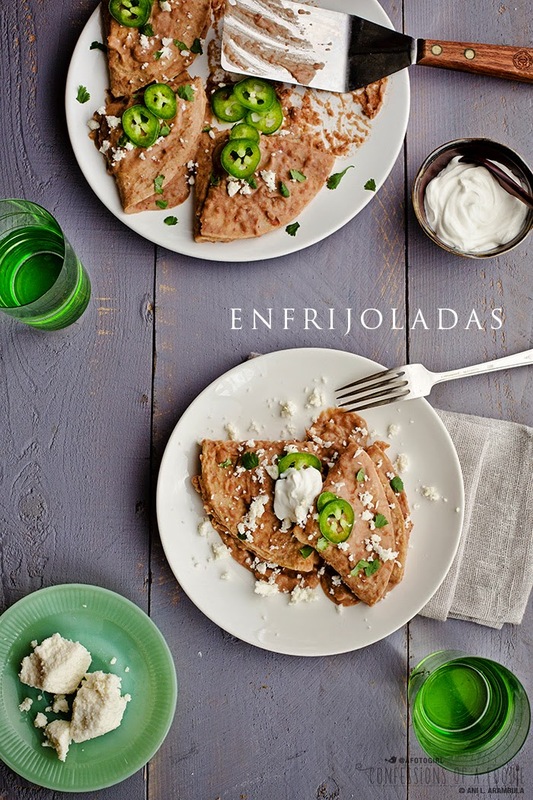 It's called 'enfrijoladas' and legend says that it started at rancheros as a quick, hearty and inexpensive meal to serve to ranch hands. It fueled the workers so they could endure the hard work that comes with running a ranch and working out in the fields." "Who knew?," she said. "I thought it was just something we made up. I guess it's just a dish that comes naturally to Mexicans," she laughed. Indeed. Later, I mentioned it to my father who gave me a strange look when I described it to him. "I don't know what you're talking about," he said looking at me like I was nuts. My mind raced quickly back in time, scanning childhood memories. Nope. I don't think dad ever partook of such a meal. Dad is a meat and potatoes guy. From carne asada, tripe, homemade chorizo to BBQ ribs, stuffed pork loin and beef stew, he really hasn't met a cut of meat he didn't like. Vegetarian meals are not in his culinary vocabulary. So it makes sense that this comfort food was one shared just between us girls and my mother who learned it from her mother as there are tons of memories of eating it at my grandparent's house. This is total Mexican comfort food. Depending on what region of Mexico, recipes for this dish call for either black beans or pinto. Our family only ate pinto beans so that's what we used for enfrijoladas. In fact, I'd never seen black beans until I was in college eating Cuban food for the first time. Now it's one of my favorite beans although my father still wrinkles his nose at the mere mention of them which explains why they never made an appearance in our house. Making this dish is super simple and really budget-friendly which is an important consideration when you are raising a family with five kids. It was a tasty way to stretch one meal into two. Basically, we would take leftover beans, reheat them, mashing them with enough water to make them soupy and sauce-like. Then we'd dunk a warmed corn tortilla into them, carefully fishing it out and folding it onto a plate with plenty of beans clinging to it. We'd often top it with a healthy dollop of sour cream (personally, I preferred ketchup. Don't knock it. Refried beans and ketchup taste delicious). Dinner served. 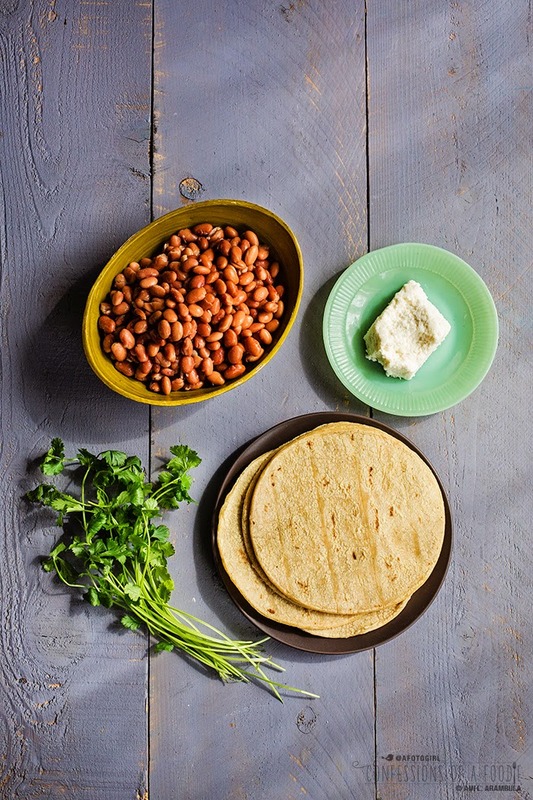 Pinto beans and corn tortillas have always been a staple in my home as an adult. So on many occasions when I hadn't made it to the grocery store and I'd come home famished from work, this was a quick dinner. It also makes a frequent appearance during lent. Although, now I've graduated to topping it with a little queso fresco (a soft, mild farmer's cheese), panela (a soft, curd-like mild, crumbly cheese) or cotija (a hard, parmesan-like dry cheese) in addition to a smaller dollop of sour cream than I used to when I was a kid. Sometimes, a meal doesn't need to be complicated to be good. This is one such meal. 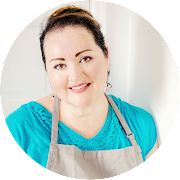 As my sister Deb is fond of saying after a satisfying meal, "Panza llena, corazón contenta." Full stomach, satisfied heart. Make this and see for yourself. This dish has a higher carbohydrate count than I normally eat these days but the beans are high in fiber and protein so even though it's not an "everyday eats" kind of meal, I am nonetheless content to have it every now and again. Homemade beans will give you the best taste but canned beans will do just fine. Feel free to use a few dashes of your favorite hot sauce in the beans to spice it up a bit instead of the jalapeño juice listed in the recipe. Or, you can also add chili powder to taste. 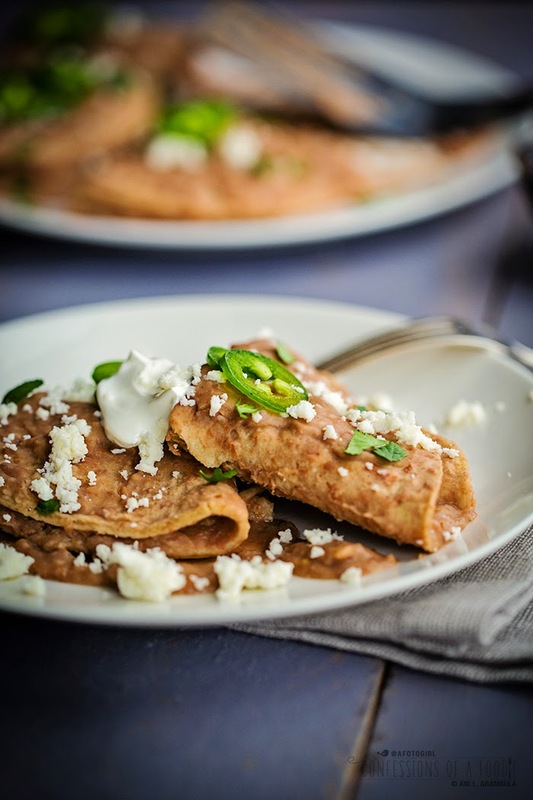 As for serving, our family always just folded it up and ate it as is but you could always lay it flat after coating it with the sauce, fill it with some Monterey Jack cheese and roll them up like an enchilada if you want a little more "filling" in addition to the beans clinging to the tortilla. Also, skip the cheese altogether for a vegan meal. 1. Place a serving platter in the oven and turn oven on to Warm setting. 2. Heat a small pot big enough to fit the tortilla on medium high heat. Drizzle oil into the hot pan, swirl to cover the bottom of the pan. Add the beans, stirring to heat through. Pour in the liquid of choice and use a potato masher to mash the beans (for a finer texture, whirr with an emersion blender for 30-40 seconds, or until desired texture). Add the jalapeño juice, stirring to combine. Reduce heat to low and simmer for 10 minutes, whisking periodically to keep the beans from sticking to the bottom of the pan. 2. Wrap tortillas loosely in a clean kitchen towel. Microwave for 30 seconds on high. Remove from oven and shuffle, re-wrap and microwave for another 30-45 seconds or until pliable. 3. Prepare garnishes and place in serving bowls; set aside until ready to serve. 4. Prepare workstation by placing the tortillas, beans, dinner-sized plate and serving platter from left to right. 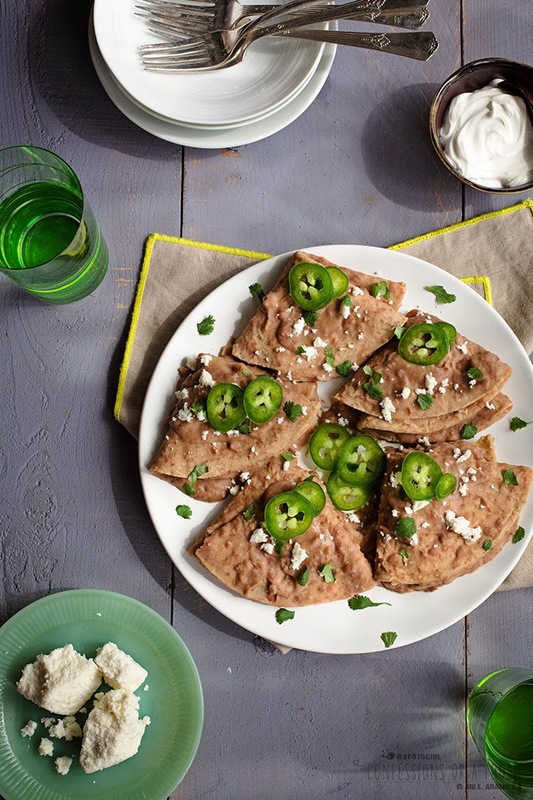 Dunk a tortilla into the beans, submerging it and immediately fish it out with tongs, being careful not to tear, and place on a plate. 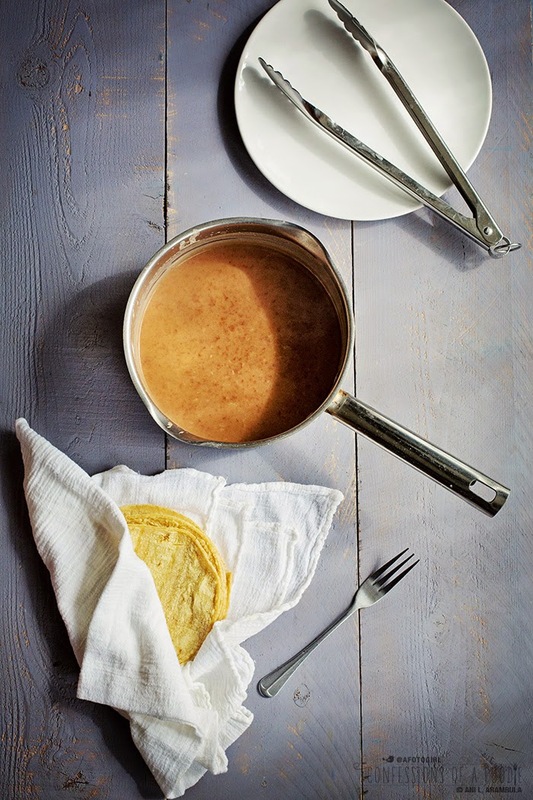 Fold the tortilla into a triangle and use a spatula to move it to a warmed serving platter (or straight onto individual dinner plates, serving 2 tortillas per plate). Repeat with remaining tortillas. Serve immediately allow diners to top theirs with any combination of recommended garnishes, to taste. Beautiful. I love simple recipes.